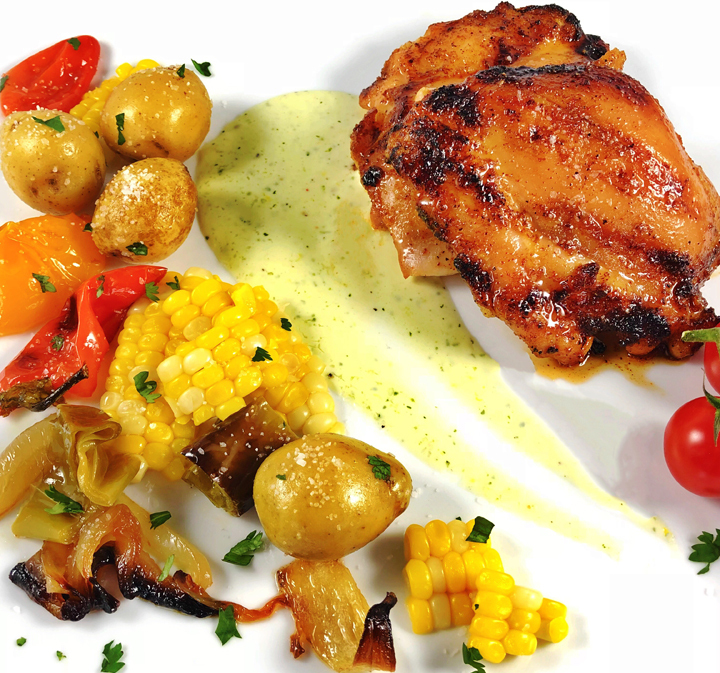 Loaded with farm fresh vegetables, spicy honey chicken thighs, and a delicious creamy lemon sauce, you can’t beat this tasty late summer dinner recipe. If you missed us at the Kentucky State Fair on the Gourmet Garden Food Stage this past Sunday, check out our farm fresh recipe! Add the potatoes to a saucepan and cover with water. Turn the burner on medium-high and bring the water to a gentle boil. Reduce heat to medium-low and cover the pan with a lid. Cook the potatoes in gently simmering water until tender, about 15 minutes or until a small knife passes easily through one of the larger potatoes. Drain and dry completely. Fill a large saucepan about ¾ full of water and bring to a boil. Add the ears of corn to the boiling water, cover the pot, turn off the heat, and let the corn cook in hot water until tender, about 10 minutes. Remove and let the corn dry completely. Add a rack in a deep roasting pan. Place the potatoes, corn, and tomatoes on the rack. Cover tightly with foil. Smoke twice with a smoking gun filled with mesquite chips. Cover tightly and keep covered until the smoke dissipates into the vegetables. Slice the corn off the cob and serve with the potatoes and tomatoes. Combine the olive oil, coriander, garlic powder, salt, cumin, and smoked paprika to make a paste. Rub the chicken thighs all over with the paste and place in a dish. Cover and refrigerate for four hours or overnight. The next day in a small bowl, whisk together the honey, cider vinegar, and ancho chili powder. Set aside. Heat a grill to high. Place the chicken thighs on the grill and cook for 5 minutes per side. Brush with the honey mixture. Cook for another minute, brush again and remove from the grill. Heat a grill to high. Toss the peppers and onions in 1 tablespoon olive oil and the salt. Place vegetables on the grill, and cook until lightly charred, 6 to 8 minutes per side. Remove and toss in the remaining olive oil. Top with fresh cilantro.